What is Affiliate Marketing? - Brigitte Belsky ~Helping You Create Your Laptop Lifestyle! Affiliate Marketing is one of the most popular online ways people are monetising their websites. It is a ‘win win win’ for the Customer, Company and Affiliate Marketer! You sign up with one or more companies that have an affiliate programme, say for quilting patterns, fabrics, tools, etc… They supply you with a special affiliate link which you place on your site. When your visitors click these special affiliate links and purchase within the pre-defined time frame, you earn a commission. Win for You the Affiliate Marketer! The commission comes out of the company’s normal retail price, so it doesn’t cost the customer any more for purchasing via your affiliate link. The customer gets what they want because of your recommendation. In some cases, your visitors won’t even have to buy anything. For you to earn a commission they may just need to request a free report, a free sample, fill in a survey or try some software. This type of Affiliate Programme compensation is known as “pay-per-lead”, but more about that later. Why do companies have Affiliate Programmes? Simply put – by offering Affiliates a commission for the sale of their goods or services they reach a wider audience faster, make more sales, increase their customer base without the added marketing costs. The company only pays the commission when a product or service is sold, so it makes business sense. As it makes business sense it’s very popular with big and small companies alike, even High Street brands. You will find free to join Affiliate Programmes for whatever niche you cater for. One of the better known companies you might of heard of is … Amazon! What is this special unique link & how does it work? Once you sign up to a company’s Affiliate Programme you will be given one or more unique links to direct your visitors to their website. Within that link there will be a code unique to you which will be automatically tracked by the power of the internet. The last part ‘zy987u94’, is the unique identifier. Whenever someone clicks on these links the computers browser remembers it by creating a ‘cookie’ with a date & time stamp. The company’s website reads that cookie to identify who is due the commission if any. Even if the visitor doesn’t purchase straight away but revisits & buys within the agreed pre-defined time frame the cookie will identify it’s your commission. A simple way is to search through your browser. 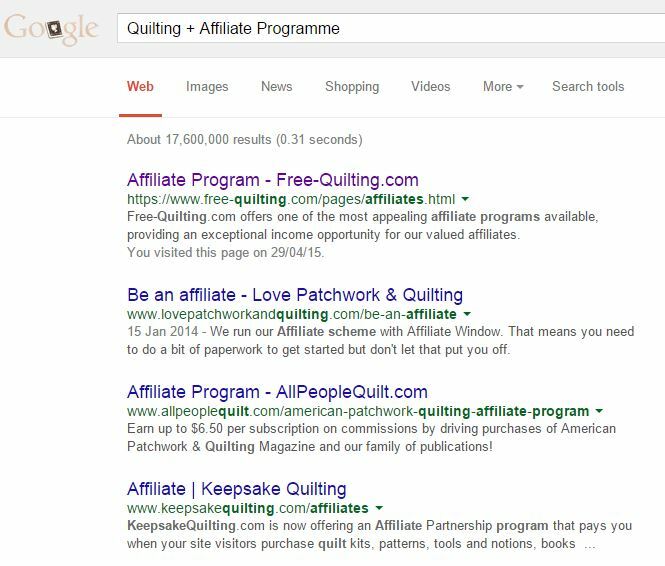 In the example above for ‘Quilting’, I simply google searched for ‘Quilting + Affiliate Programme’ & got over 17 million results. Granted they won’t all be relevant, however the first few pages gave me a lot of choices. Affiliate Networks bring together companies that offer Affiliate Programmes & Affiliates who want to promote them under one roof. Sort of like a Supermarket for Affiliate Marketers. They often run and manage the Affiliate Programme on behalf of the company. Again Affiliate Networks will have their own look & feel and vary in what they offer. Some specialise in certain niches. One of the better known market places for digital products. They offer over 6 million to choose from in a wide range of subjects. Manages many of the affiliate programmes for some of the biggest companies in the world. For High Street brands in the UK, USA, Ireland, Canada, Europe. There are far too many to list. When I googled ‘affiliate networks’ I got over 10 million results. Of course you can fine tune your search by adding say the country you may want to focus on. What Types of Affiliate Programme Compensation are there? … An Affiliate Marketers visitor completes & submits an online registration, membership, or subscription on the Affiliate Programmes website via the Affiliate Link. … An Affiliate Marketers visitor purchases a product or service from the Affiliate Programmes website via the Affiliate Link. How do I sign up for an Affiliate Programme? Affiliate Programme requirements will vary from company to company. You’ll apply by completing the chosen company’s application form, normally found on their website. They will review your application, check you meet their criteria and then will notify you of their decision. Some companies will not accept a new website, as it doesn’t have a track record or enough visitors. But don’t despair! Over time the work you do on your website will improve & strengthen it, you can then reapply, so really it’s only a no for now. Are they paying their Affiliates? A great place to ask these types of questions and get answers from first hand experiences is within the Wealthy Affiliate Community. 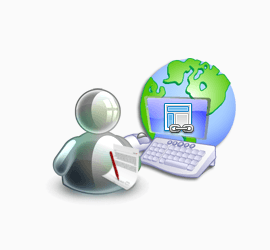 Most Affiliate Programmes will also give you a login to their websites affiliate back office. Your ‘for your eyes only’ admin area. Each company will have its own look & feel. Generally you’ll have all the information relating to your affiliation with the company including the Terms & Conditions, banners (pictures) you can use to promote, your unique links, your sales, commissions due & earned. You decide! It’s all up to you & what you do! However like any business it won’t happen overnight. The more you apply yourself to growing your business, the more your earnings will grow. The work you do today & every day will have a compounding effect for your future earnings. So many people start part time. Everyone is different. The Affiliate Marketers earning 5 & 6 figure incomes within 2-4 years, started out the same way as everyone else, but followed a consistent plan of action focused on helping people. Some started seeing a profit within a couple of months whilst others it took a year. So you’re excited about Affiliate Marketing and you now have an idea on how to monetise your website/blog. But where to start? How to put it all together? Wealthy Affiliate has so much information on Affiliate Marketing, including step by step courses so you can start right and fast. A community you can reach out to for advice on ‘how to & best of’. A great source for seeing a range of Affiliate Marketers websites, see the ‘what & how’ they do it.